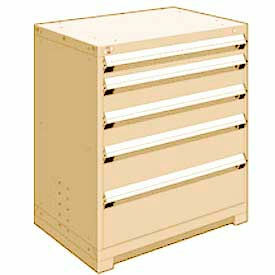 This Heavy-Duty Cabinet has 5 drawers (1 at 4"H; 2 at 6"H; 1 at 8"H; 1 at 10"H). 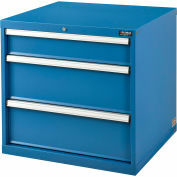 Drawers open smoothly to provide 100% access to drawer contents and feature full-width ergonomic handles. 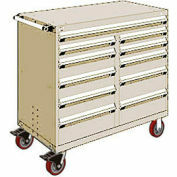 400 lb capacity per drawer. 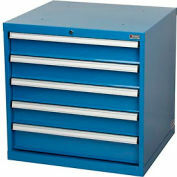 Includes Lock on cabinet housing and 2" base front access forklift base. Steel construction painted Beige. 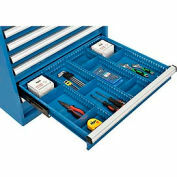 Drawer comes with Divider Kit. Cabinet comes with Lock (keyed differently) to secure all drawers. Optional lock types (keyed alike, master key access, etc.) available. Call for details.